A crowd at the interactive festival at the Austin Convention Center from the 2010 South by Southwest Conference held in Austin, Texas. Editor’s Note: Priya Parker, an expert-in-residence at the Harvard Innovation Lab, is the founder of Thrive Labs, a visioning and strategy advisory firm based in Brooklyn, New York. You can follow Priya on Twitter @priyaparker. If January is when the old guard gathers in Davos, Switzerland, March is when the new guard descends on Austin, Texas. At a time of crisis in America, Europe, the Middle East and beyond, a group of tech-savvy do-gooders meets, greets and tweets at South By Southwest. The conference has experienced a surge in popularity in recent years, exploring questions well beyond the sphere of technology. 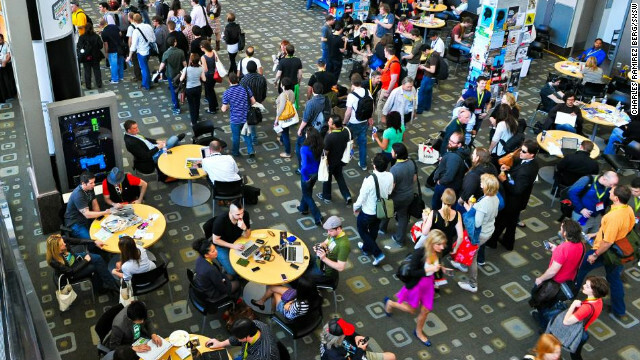 The several hundred panels and featured sessions for this year’s SXSW Interactive tend to reflect the current concerns of the rising elite. In this post, I’d like to add one concern to their list: Can the avid, accomplished doers at SXSW show the way for a rising generation of Millennials who are all too often afraid to fulfill their potential as leaders? I run an advisory firm that works with leaders young and old to conceive and implement bold, authentic visions. As part of that work, I recently completed a year-long study of the values and behaviors of the world’s next generation of leaders – the most talented, educated, capable Millennials. I was curious about how this rising cohort of leaders makes decisions and plots the future. I concentrated on dual degrees, or graduates of elite master’s degree programs in both business and public policy. These are people in their late twenties and early thirties who have usually worked in both the public and private sectors, lived in multiple countries, and passed through some of the most prestigious organizations on earth (the Gates Foundation, McKinsey & Co., offices of prime ministers and presidents). What I found was a rising generation of elite leaders who bring wonderful new gifts to the table – more empathy than their predecessors, more worldliness, more pragmatism for an angry, ideological age. But I also found my generation of young leaders paralyzed, hesitant, and unwilling stick their necks out and lead on the big questions of our time: how to build a more equitable and sustainable capitalism, how to manage the transition to a post-Western world, how to extend prosperity to developing countries without pushing the planet over the brink. But strange anxieties are getting in the way of these ambitions – none more prominently than something called FOMO. It is the “fear of missing out,” and it has been written about by others (including in an article about SXSW last year) as a phenomenon caused by social media. These media show them all the cool places they could be and cool things they could be doing, which always seem better than where they now are. However, my research shows that FOMO is leaking out of the technology realm and becoming a defining ethic of a new generation. Those with the most options in this generation have a tendency to choose the option that keeps the most options open. Wrap your head around that for a second. It’s one of the reasons that management consulting has become so popular among today’s young elites. A current consultant told me, “For me personally, it was lack of clarity.” He added: I knew the types of jobs I wanted, but there wasn’t something specific out there calling me.” A number of other subjects said that they didn’t feel “ready” to take on the problems that most interested them. They wanted to linger and dabble and “learn” for a while longer. As a result, the North Star of this cohort has become what many of its members call “optionality.” There is great worry that they’re going to choose the “wrong” option. In the last year, I’ve run over 100 Visioning Labs with individuals and groups of young leaders to help them identify their values and passions, and build visions that reflect what they want to do in the world. In one exercise, I ask people to imagine a year away from their present work and cares, with unlimited time and resources. People speak of doing things like “write a book,” “launch a venture,” “spend time with my grandparents,” “produce a film.” I then have them circle the top three options and reflect on them. Fear and practicality are the most commonly cited reasons for not doing such things in real life. And when they begin to think about what they want to do in the future, many look at their immediate next step as the one that will keep the most doors open so that they can have a Pocket Year much, much later. A number of subjects talked about risk aversion rising with success. One subject said, “I’m probably unhealthily obsessed with making the right choices.” He added: “I think it comes from a fear of missing out on something bigger and better in whatever you do. So I like to think of myself as someone who has made good choices up until now and I have enjoyed the kind of outcomes that I’ve been able to get from making those kind of choices. Over the next two weeks, I will write a series of posts on CNN.com/GPS sharing what I’ve found to be the obstacles blocking our generation of Millennials from thriving, as well as some of the activities that I’ve observed lead people to thrive again. This week’s gathering in Austin attracts the most adventurous and risk-seeking members of the Millennial cohort. But as they gather to discuss and debate and design the future, I hope they will help think about how to get the rest of us to think bigger, think bolder – and to do. The views expressed in this article are solely those of Priya Parker. « Previous entryZakaria: Another war in the Middle East? I am refering back to this article to address just another young person who was/is talented, but has given up to local society pressure... Just to give her some support in remembering her capacity. Nice article! In the last year, I've noticed it was getting harder and harder for me to make decisions. I did some research, and wrote a short article on this topic. will get even harder nowadays for months to come till the 1/2 elections. The sy in the leading party, Fuat Avni says the order is out to get the media against AKP regardless of the cost and means. We will wait and see.